They met in high school at McGill-Toolen as Patrick was a friend of Kathy’s brother, David. However, they reconnected 20 years later when Patrick volunteered to help Kathy repair fences in the very pasture where they eventually exchanged their vows. 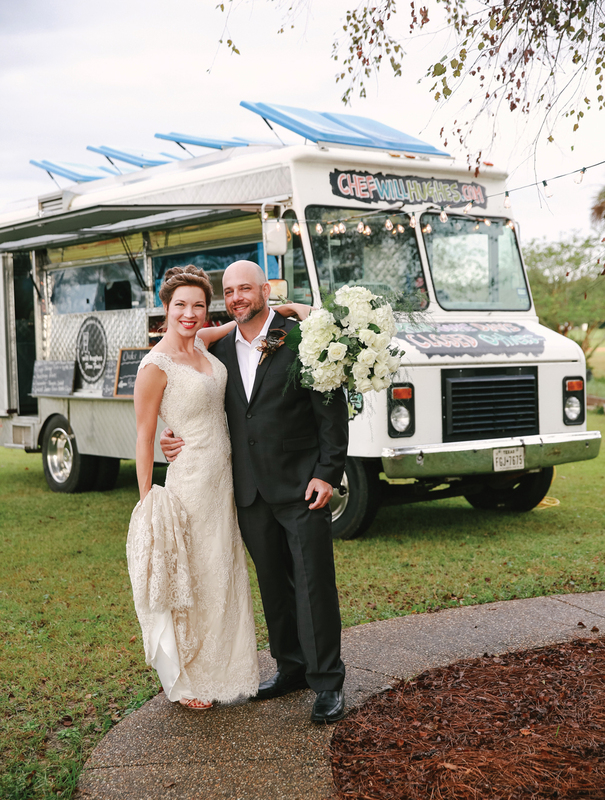 The rain cleared in time for a warm and inviting celebration with family and close friends. Kathy’s three children, Christian, Rachel and Tyler, were thrilled to welcome Patrick into the family. Handmade décor and desserts by dedicated family members added a personal touch. The bride’s bouquet was lovingly handcrafted by her brother David and featured white hydrangeas and roses, seeded eucalyptus and even some asparagus ferns from Kathy’s garden. 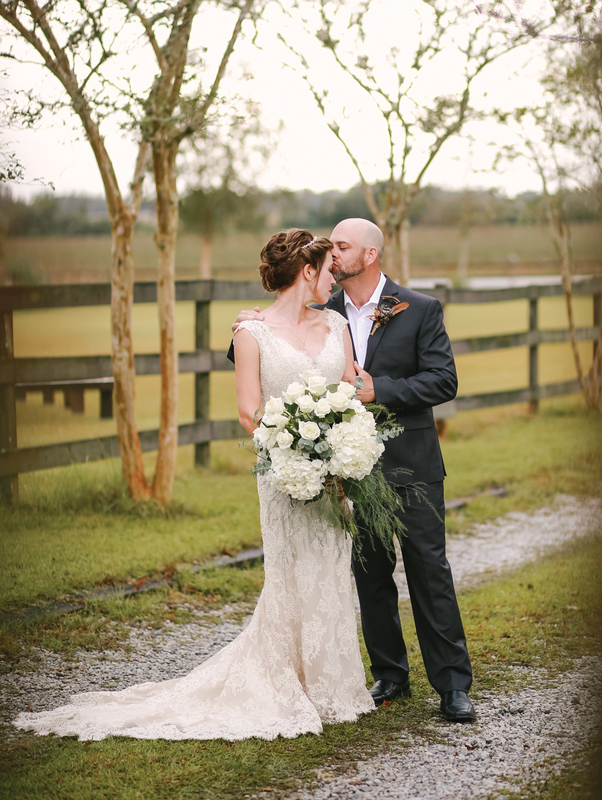 Kathy wore a champagne, lace gown by Allure Bridals which invoked sepia-toned elegance. Patrick wore a timeless charcoal suit by Kenneth Cole. 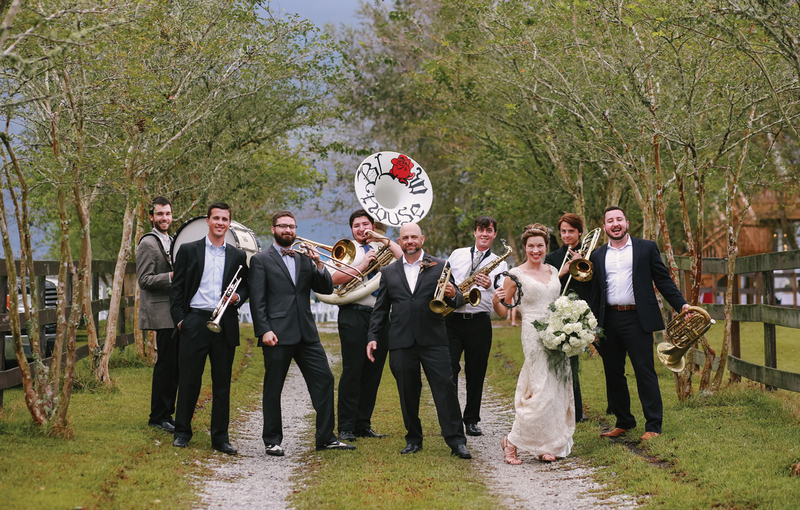 Blow House Brass Band, of which the groom is a member, provided fantastic Mardi Gras-style entertainment that got everyone moving and injected a great dose of fun. Upon reaching the end of the aisle at the recession, Patrick picked up his trumpet and joined right in. Local farm-to-table bites from Chef Will Hughes and his food truck were a crowd favorite and kept them coming back for more. 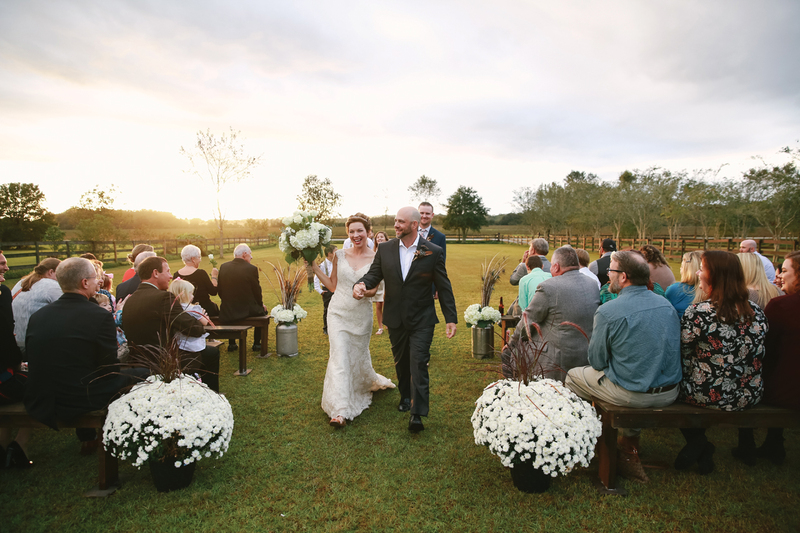 Morgan Joy Photography expertly captured all the magic of the evening with the pastoral sunset as a backdrop.